Shoubu wa Toki no... Un Daro? is actually a series which Takaguchi co-writes with another artist. 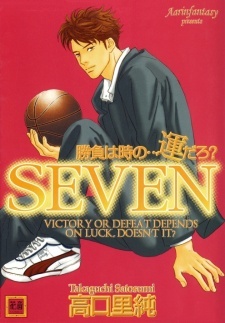 SEVEN is a solo work using many of the same characters, but takes place slightly later. It is about the members of the basketball team at a sports-based high school. The first chapter focuses on a new character, Kiyoshi. Although he is attending a sports-based school, he is unable to play sports because of a childhood accident. He isn't dealing well, until Nana (Seven) takes him under his wing and asks him to be the manager of the club. Prequel: Shoubu wa Toki no... Un Daro?